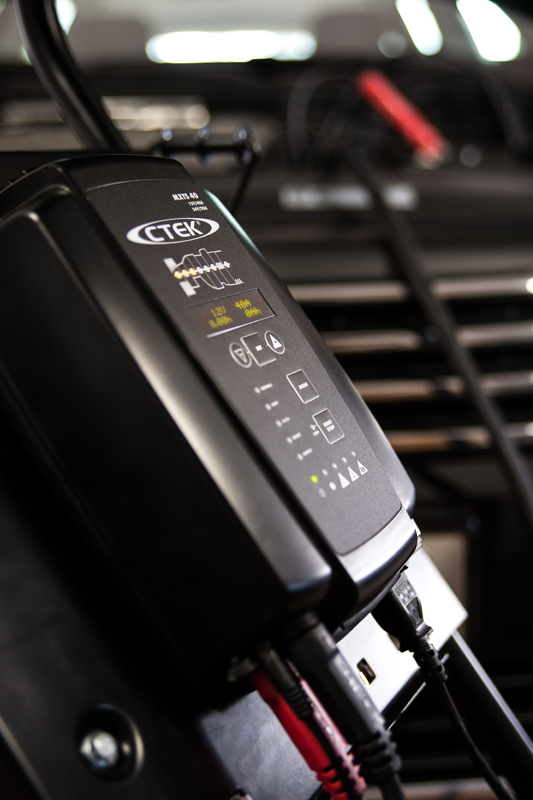 CTEK explains exactly why batteries need support during vehicle diagnostic work. If we take a look at modern vehicles, it could be argued that the most expensive computers that a commercial vehicle business owns aren’t sat in the office, but out on the road. And whether the vehicle is in use or in the workshop, the battery is being placed under great strain – we therefore cannot ignore the demands that complex vehicle technologies are placing on commercial workshops. could cause you problems when carrying out work on the vehicle. So, whether you are repairing a vehicle, testing electrical circuits, carrying out diagnostic procedures or flash programming ECUs, battery support is a vital activity often not fully appreciated for its ability to save the technician time and hassle. It will also guard against programming failures and prevent possible costly damage to the ECU. Battery support units deliver high levels of power over a relatively long period of time, and as a consequence they can generate a lot of heat. As a safety precaution, many units are set to de- rate. This is a process whereby the unit will reduce charge levels, and at really high temperatures reduce current output. De-rating is becoming a huge challenge to many workshops, risking disruption to the diagnostic or reprogramming procedure. The reprogramming of ECU modules and fault code diagnostics requires the ignition to be switched on without the engine running. This means that during programming, the vehicle’s systems are operated solely from the power of the battery. Maintaining battery charge is critical to avoid unnecessary downtime, lost vehicle data or even damage to sensitive electronics. ‘Battery support’ (as distinct from charging) is vital for the supply of ‘clean’, constant voltage for vehicle programming. It will also protect against loss of battery charge, and against the battery from discharge when the work is complete and the vehicle is back out on the road. Should battery voltage alter significantly during reprogramming, the program can fail – meaning a time consuming restart or worse still – the ECU can be damaged beyond recovery, requiring expensive replacement. 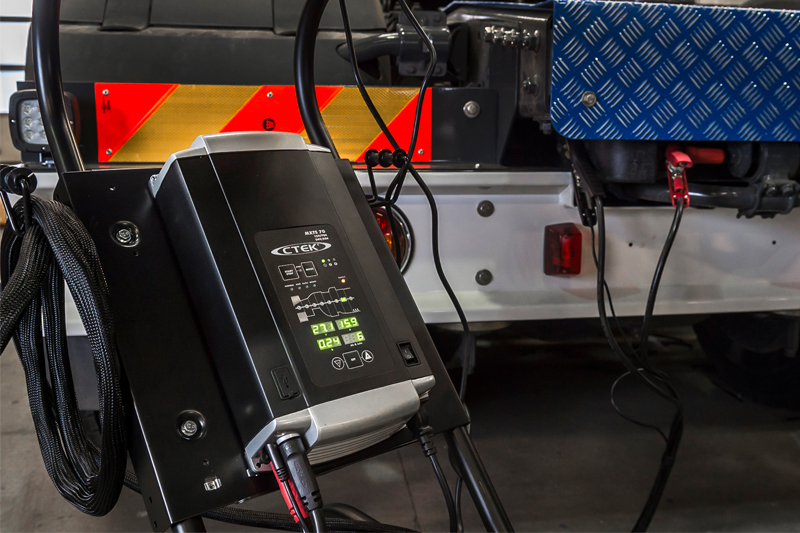 Using equipment dedicated to battery support is now a necessity in the modern commercial vehicle workshop. Using a slave battery, a standalone battery charger or booster pack is not appropriate. Slave batteries and boost packs are unreliable as they depend on a battery themselves, so they can struggle to cope with sudden increases in current demand. ‘Pure’ battery chargers are not recommended either, as they can increase battery voltage beyond operating levels – fine for charging – but can affect reprogramming procedures, as well as possibly damaging sensitive test equipment. The MXTS 40 from CTEK provides a stable voltage and up to 40A in 12V mode, and 20A in 24V mode, of fully regulated power. This prevents loss of charge and damage to the battery, so it’s ideal for a wide range of commercial vehicles with average power consumption. If even more power is required, the MXTS 70 provides up to 70A of battery support, 35A in 24V. This unit gives the flexibility to cover all vehicles, including high specification vehicles with large flash programming demands.